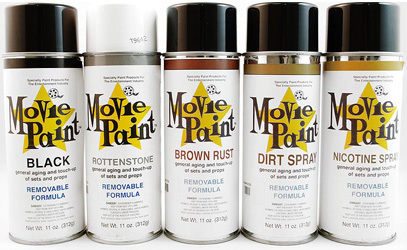 Add richness and character to your props and productions with Movie Paint products! 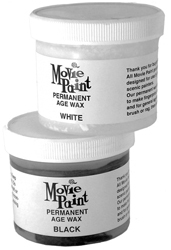 Essential tools for special effect technicians, production artists and prop masters, they allow you to realistically dull, age, tarnish or rust any desired area. And since they’re made from translucent formulas, you can easily control the density and effect. Available in 12 distinct colors, Removable Spray Paint creates believable effects both on and off camera. Indeed, you can use it to provide photos or documents with an aged, archival quality or make new wood suddenly appear centuries old. These sprays will temporarily paint, distress, dirty, age, or simply add character to almost anything. Fortunately, they easily wash off non-porous surfaces with warm, soapy water. Quickly age props and give small areas that “years-of-neglect” look with Permanent Age Wax. An amazing product, it’s available in white, black, gray, red rust, brown rust, nicotine and dirt. And although it’s technically permanent, it can sometimes be removed with mineral spirits. As the name implies, Cobweb Spray creates fantastic, realistic-looking cobwebs for theater, TV and film productions. And it’s easy to use; simply spray (using a sweeping motion) on candle holders, mirrors, furniture or any other piece as needed. Importantly, it can be removed with most adhesive removers. This Chroma Key Spray allows you to create an inexpensive Chroma Key area for your production. And, thanks to spot-on color saturation, it will match all Chroma Green fabrics, card stock, paper and roll on paint. 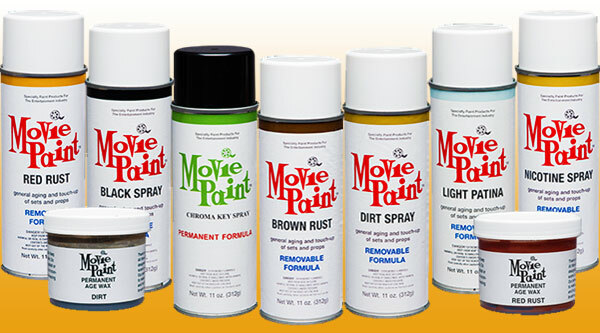 Give your upcoming production that professional polish and pick up some Movie Paint products today! Tagged chroma key spray, cobweb spray, movie paint. Bookmark the permalink.